So let it be written? So let it be done? 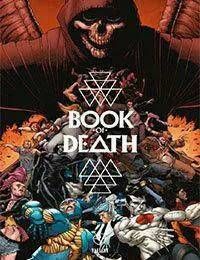 From New York Times best-selling writers Robert Venditti (X-O MANOWAR), Jeff Lemire (THE VALIANT), Matt Kindt (DIVINITY), Joshua Dysart (IMPERIUM) and a powerhouse roster of all-star artists comes the blockbuster crossover event that will forge the future of the Valiant Universe - collected in its entirety for the first time anywhere! The Valiant heroes. X-O Manowar. Bloodshot. Ninjak. The Harbinger Renegades. Unity. This is how they lived. This is how they died. Now we know. The Book of the Geomancer has recorded it all. But only a young girl - the last in a line of the enigmatic mystics who protect the Earth known as Geomancers - has seen this future come to pass, from the coming cataclysm to the dawn of the 41st century. Alone with her sworn protector, the Eternal Warrior - a soldier battle forged across five thousand years of combat - the duo must defy their allies to stop the Dark Age that now threatens to eclipse our world. Together, they are the number one target of every hero and villain on Earth. Either the Eternal Warrior hands her over?or they take him down. But can even he singlehandedly protect one child when the entire Valiant Universe wages war against him?